Total Guitar and Metal Hammer backed practical courses for vocalists, bassists, drummers and guitarists. 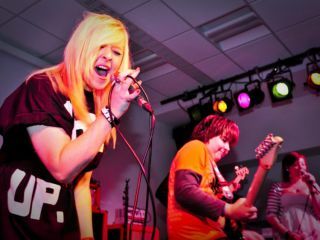 BIMM (Brighton & Bristol Institutes of Modern Music), the UK's leading rock 'n' roll college, are opening Early Bird booking for their 2011 Summer Schools. Throughout December 2010, the price for the Summer School will be £250. After this time, the price will be £299.00. To make an Early Bird booking go to www.bimm.co.uk or call 08442 646 666. The college will be running three courses during August 2011 from their campuses in Brighton and Bristol. The courses, sponsored by Total Guitar and Metal Hammer magazine, offer the opportunity to study technical development and live performance skills in vocals, drums, guitar or bass, using industry standard equipment whilst being taught by some of the biggest names in modern music. BIMM accept all levels on their Summer School, though they are not suitable for absolute beginners. Mark Clayden, BIMM Bristol College Manager and founding member of Pitchshifter and This is Menace said: "The summer schools are awesome, the tutors and guests help to cut away all the myths and get down to the basics of making you a better player." BIMM is a college run by musicians for musicians, with a strong emphasis on live music and playing instruments well. BIMM has enjoyed continued success over the last nine academic years with high student numbers, an impressive alumni and an unrivalled relationship with the music industry. Between them, BIMM tutors and guests have sold hundreds of thousands of albums, been signed to major and independent record labels, had chart hits, toured the world and played the main stage at Download, Glastonbury, Reading and Ozzfest, recorded dozens of Radio 1 sessions, as well as featuring their music in films, on TV and in video games. Roger Daltrey, who recently gave a Masterclass to students attending BIMM Brighton commented "I am impressed by what you have here guys, you are very lucky". Bob Geldof sang the praises of "BIMM's track record as the leading provider of modern music training in the UK, and the success of their graduates and their employment in all areas of the music industry, plus many hit record successes". Star Tutors and Special Guests being lined up to appear at the 2011 Summer Schools include members of: Skindred, Nevermore, Paul Weller, Cooper Temple Clause, CSS, Testament, Skunk Anansie, Blue Aeroplanes, Ghost Of A Thousand, Gay Dad, Reef, Carl Palmer, The Crimea, Biomechanical, Prodigy, Hundred Reasons, Sikth, Therapy, Pitchshifter, Slaves To Gravity, Brian Molko, This is Menace, Malakai, Kerrang! Radio, Total Guitar Magazine, Guitar Techniques Magazine, Guitarist Magazine, Rhythm Magazine (all subject to availability). Course details on the next page. You will be studying and playing pop, rock, indie, blues and funk, including songs in the style of: Deftones, The Killers, Kings Of Leon, Oasis, Bloc Party, Babyshambles, The White Stripes, Kaiser Chiefs and many more. You will be studying and playing pop, rock, indie, blues and funk, including songs in the style of: Deftones ,The Killers, Kings Of Leon, Oasis, Bloc Party, Babyshambles, The White Stripes, Kaiser Chiefs, Funeral For A Friend, Lost Prophets ,Enter Shikari and more. You will be studying and playing songs in the style of: Metallica, Trivium, Down, Iron Maiden, Slayer, Lamb of God, Airbourne, Black Sabbath, AC/DC, Lamb Of God, Gallows, System Of A Down, Mastodon, Kiss, Rammstein, Steel Panther and more. Information taken from official press release, for more visit BIMM.